...who was born into a farming family and after leaving school he took up an apprenticeship in butchery. Cattle have always been a part of his life - from rearing his first calf on a bucket at 10 years old to buying prize winning cattle at primestock shows for his butchery business. Farming in NI is so much different to that of Scotland with smaller fields and stock having to be housed for up to 7 months of the year (due to strict cross compliance regulations which can lead to lose of Single Farm Payment (SFP)). So you may ask why keep Luings -surely they are bred for outwintering? Twenty months ago I might have agreed with you but having talked the talk and walked the walk I now am beginning to see that Luings can fit in well to suckler cow production in NI. As I write this article it is late October and we have just had one of the wettest years ever recorded. It is in situations like this that I can see the Luing cow coming into her own. The wet and the cold do not seem to have the same negative effect on them as I see on other breeds. The fact that the calves are able to thrive at this late stage of the year without poaching means stock can stay out that little bit longer, saving on expensive winter feed. In 1996 my wife Margaret and I sold our butchery business to concentrate on full time farming. At this stage we only owned 40 acres and rented another 50. With Agricultural land at £10,000 an acre to buy we decided to go into poultry production. We set up 3 broiler breeder houses producing hatching eggs for a local large chicken processing company. In the past we bought around 80-100 clean eared (without any Beef Special Premium (BSPS) claims against them) cattle in the spring of each year, grazing them to September and housing in October. Using a diet feeder and plenty of hard feeding we finished them in January and February. With two BSPS claims, two extensification claims and a slaughter premium claim this system worked well. This all was to change in 2005 following the CAP reform. In the first year of the Single Farm Payment we were almost £7,000 worse off than in previous years, it was time for change! Around this time we were reorganising our yards to comply with the EU Nitrates Directive and thought this would be a good time to arrange our sheds to suit suckler cows - but what type? Dairy cross heifers were showing too much Holstein and continental crosses were too wild. It was while attending the Royal Highland Show in 2005 that I found myself on the Luing stand admiring two blood red bulling heifers from Benhar. The next few months were taken up with phone calls to Scotland and reading literature, wondering whether to buy Luings or Sim-Luings. The decision was made in Autumn 2006; we would buy Luing bulling heifers. Arrangements were made to attend Castle Douglas in February 2007. As I sailed across the Irish Sea I was reminded of words that my father had told me years earlier "Remember the day you buy is the day you sell" and boy did that cost me as six hours later I had bought 17 heifers on one of the best trading Luing sales ever recorded. My new herd would consist of four Buckholm, two Upperchatto, two Welbeck, one Merkland and eight Nunnerie bulling heifers, followed later in the year by 4 in-calf heifers from Attonburn bringing the total to 21. The 17 Castle Douglas heifers were served to Benhar Horizon a son of Dynamite, bought by phone from the McNees. Spring of 2008 saw us with 21 living calves (11 heifers, 10 bulls); with only one assisted calving. The Luing was certainly living up to its reputation. 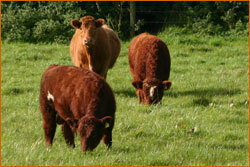 February 2008 saw us back in Castle Douglas where we purchased another six heifers. My interest in Sim-Luings hasn't waned, 18 of our cows have now been served to the Simmental, with the heifers all spoken for by neighbouring farmers before they are even born. This does not surprise me as in the Farmers Weekly dated 3rd October 2008, one of Northern Irelands leading Simmintal breeders wrote, "To compete with the dominance of the other continental breeds, we have had to breed smaller cows, produce tight udders and retain the foraging, mothering and calving ability that the Simmental is renowned for" - that sounds very like a Sim-Luing to me. In the future I would like to see the Luing and Sim-Luing breeds take off in NI where they already have a growing interest. With some targeted promotion along with other local breeders I feel these breeds have a lot to contribute to the famer in NI striving to find the perfect suckler cow.